Fast Folder & Command 1.0 is launchers & task managers software developed by Wpg Software Inc..
Fast Folder is a shell enhancement that gives you fast access to your favorite folders in Common Open/Save dialogs, the desktop and in Explorer. Fast Command will help you create run-commands for use in the Start Menu's Run -dialog. 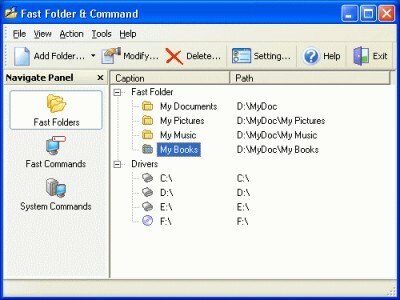 The commands can launch programs, open folders, run files and launch URL's. This program is shareware, which means you can download and use Fast Folder & Command 1.0 for free during 30-days trial period. After this period you gonna have to buy Fast Folder & Command 1.0 software for $19.95 or uninstall the program. Fast Folder & Command 1.0 supports different languages (including English). It works with Windows 98/XP/Vista. Latest Fast Folder & Command 1.0 does not contain any spyware and/or advertise modules, allowing installing it with no worries concerning valuable information loss. Our website has thoroughly tested system utilities product Fast Folder & Command 1.0, written the review and uploaded installation file (880K) to our fast server. Downloading Fast Folder & Command 1.0 will take several seconds if you use fast ADSL connection. Create run-commands for use in the Start Menu�s run dialog. Quick jump to your favorite folders and preview image in the context menu. Handy utility that provides fast access to your frequently used folders.